A tale about passionate love and finding your soulmate… Only to realize you will always come a close second. When Potnis, a captain in the Indian Army, meets Pansy during Operation Blue Star, he knows he has found the love of his life. Their passionate romance leads them to the altar and blossoms into a beautiful child, Rihana . 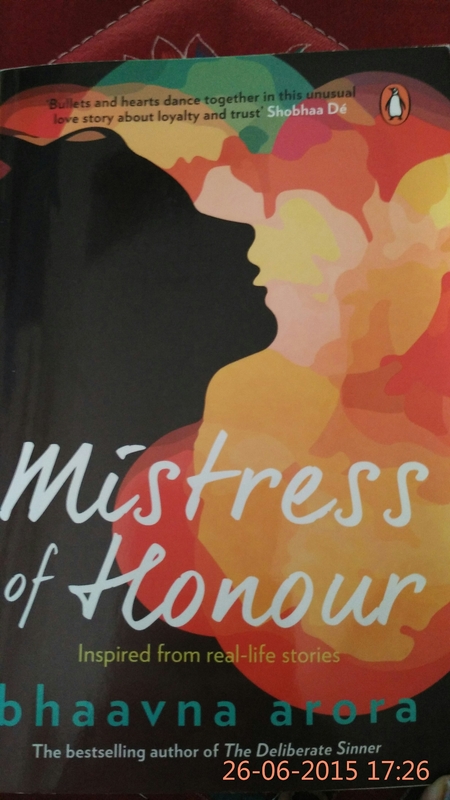 Mistress of Honour is fun, light read. Deepak Potnis, a Captain in the Indian Army falls in love with Parminder Kaur Sodhi aka Pansy in the midst of operation blue star at the Golden Temple. Pansy, who lost her parents during the operation has also lost the reason to live. Potnis gives him hope and reason to not just live but live happily. They both get married when Pansy realises she is pregnant. They are blessed with a girl who is as beautiful as Pansy and as courageous as Potnis. Rihana is growing up and so is Potnis in his job. Potnis is given another important mission which leaves him emotionally broken forever. History repeats itself when a grown up Rihana falls in love with Advik, Indian airforce Pilot. Before they could tie knot, Advik is asked to report for kargil war. Advik, who loves his country more than Rihana leaves her in a spot where she has to make a serious decision. At 191 pages, this book really is a light read, two to four hours max. I wouldn’t have mind 100 more pages if the Author had given more footage to Operation Blue star, Sri Lanka civil war and Kargil war. This book highlights the personal lives of real life heroes(army men) and their families. Lives of Families of Army men are far from normal. Their sacrifices are bigger than ours. I really liked the parts where Potnis was remembering his training days. Even Advik and Kabir’s NDA tales were funny. I somehow feel, the women were given very little space in the story. Also, there was no element of surprise.